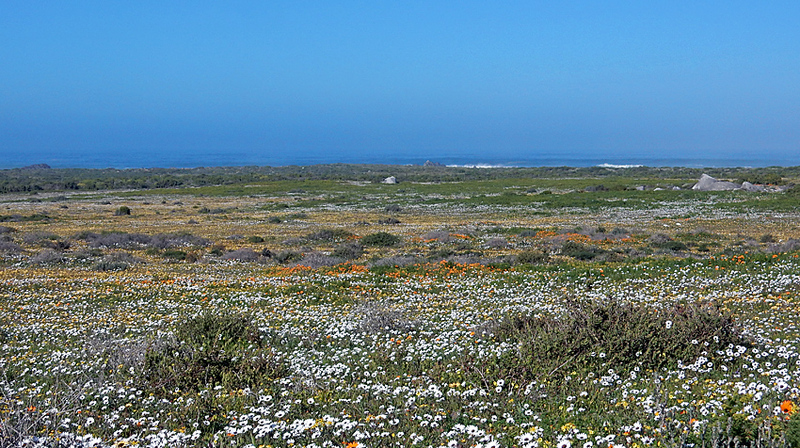 I haven't gone to see the spring flowers on the west coast in a long time. 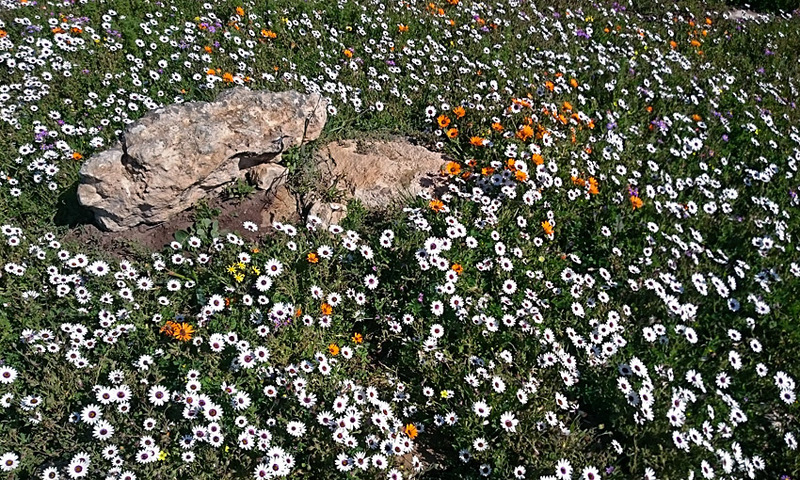 The Western Cape has been experiencing a harsh drought in recent years, but this year we received slightly better rain. So, I thought I would take a chance on some spring flowers. We were not disappointed. It was a beautiful sunny and windless day. The birds were enjoying the show. The animals were feeling frisky. But the most interesting surprise of the trip was brought to us curtsy of the insects. I had my window open while driving and every now and again some small bees would get sucked into the car, zipping right by my ear. Stopping at a lookout point, I decided to roll open the rear window for the bees to get out. It was then that I noticed that these bees look a bit different to the usual honey bees. I decided to snapped a few photos before setting them free. 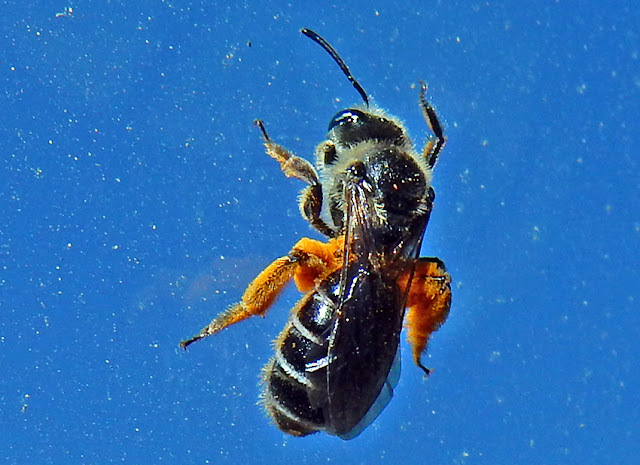 I was lucky, and the observation caught the eye of an iNaturalist user that was able to identify the bee as part of the Andrena genus. Thanks to him (and I guess me for uploading the observation in the first place) this turned out to be the first observation on iNaturalist of the Andrena genus in sub-Saharan Africa! Sure, it is likely that somebody else has uploaded one of these bees to iNaturalist before, but this is a great example of how valuable the people are that help identify the observations. There is no way I'm able to tell on my own that this is a type of Mining Bee, yet thanks to international experts like this, who identifying observations by normal citizens like me, we can both help contribute to science and conservation - and in doing so have a lot of fun in the process. I've learnt a ton of fascinating new things since joining iNaturalist. Really exiting stuff! 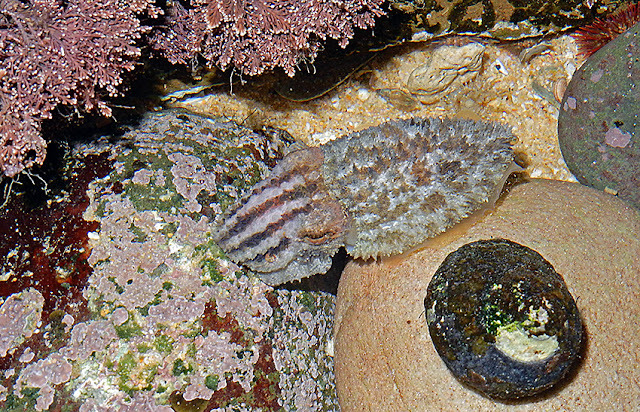 Some time ago I shared a photograph and video clip of a small Cuttlefish I found in a rock pool at the Woody Cape. 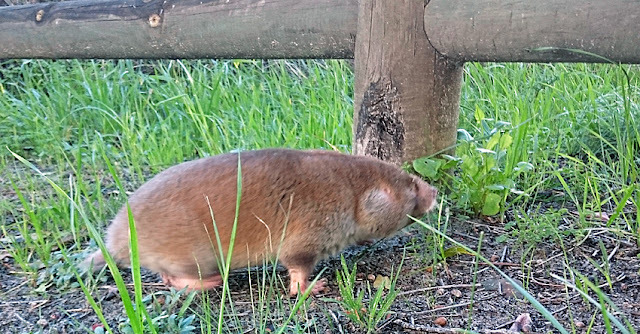 I always keep my eyes open for another glimpse of this little creature, and I was lucky enough to find another one during my previous visit to the area. I encountered the first Cuttlefish (over here) during the day. At the time it seemed to pretend to be a dark grey pebble. 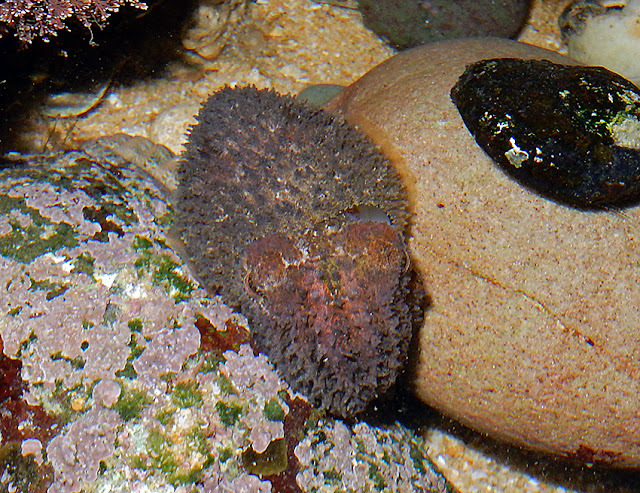 However, this time around I was visiting the rock pools at night and this little guy (or gal) put on a very different show. Overall it had a much more "spiky" appearance than before. I assume that it was trying to fit in with the texture of the red sea algae growing in this small tidal pool. "Erm, I'm not a Cuttlefish, I'm a fuzzy pebble? Right?" I think it realizing that there aren't any other fuzzy-pebbles around and instead opted to stick to a more general whitish colour. Or maybe it was spooked by the light from my headlamp. "Eh, I meant: I'm not a Cuttlefish, I'm a whitish piece of sea-stuff. Right?" I love how they use their two large tentacles as little arms. 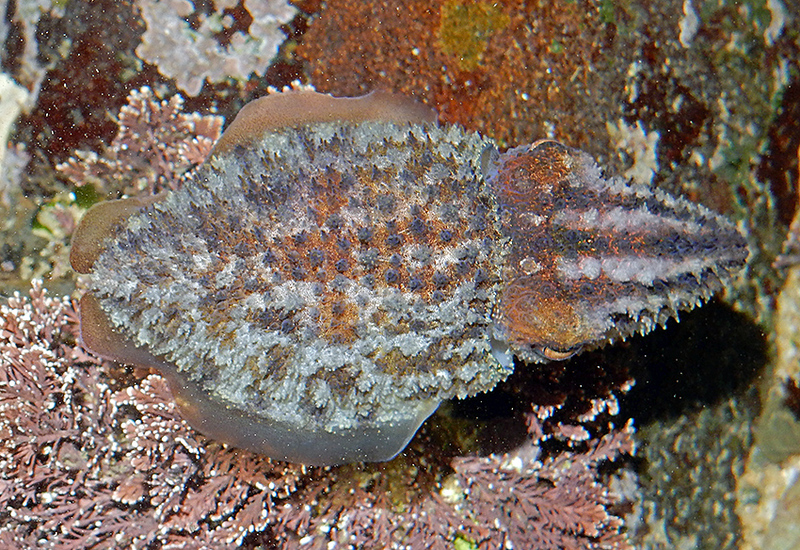 It is also interesting how the pupils of Cuttlefish are a strange horizontal wave-like pattern. Below is a short video clip of the little critter swimming around and trying to avoid my attention. 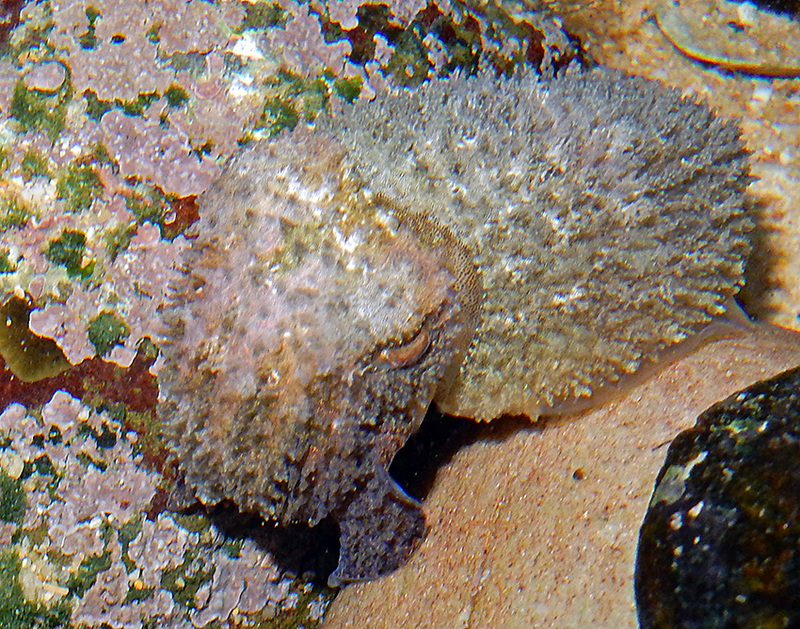 Video: "I'm just an innocent little Cuttlefish. I'm not well-suited for the limelight..."
I'm not entirely sure of the species, nor sure where to find good information about South African Cuttlefish, but I believe it is likely that it feeds on shrimps and uses sticky glands to help it stick to the rocks. "Nothing to see here... I'm just some floating sea-stuff... Not a Cuttlefish at all..."
Finding the Cuttlefish at night was a pleasant surprise. I want to try and visit the tidal pools more often at night. Who knows what else might be waiting to be found. I recently had a little money set aside to buy something fun for myself. I've always wanted to play around with a microscope, so I searched online for a decent (but cheap) microscope. I'm pretty happy with my purchase, but I don't get around to using it as often as I would like. 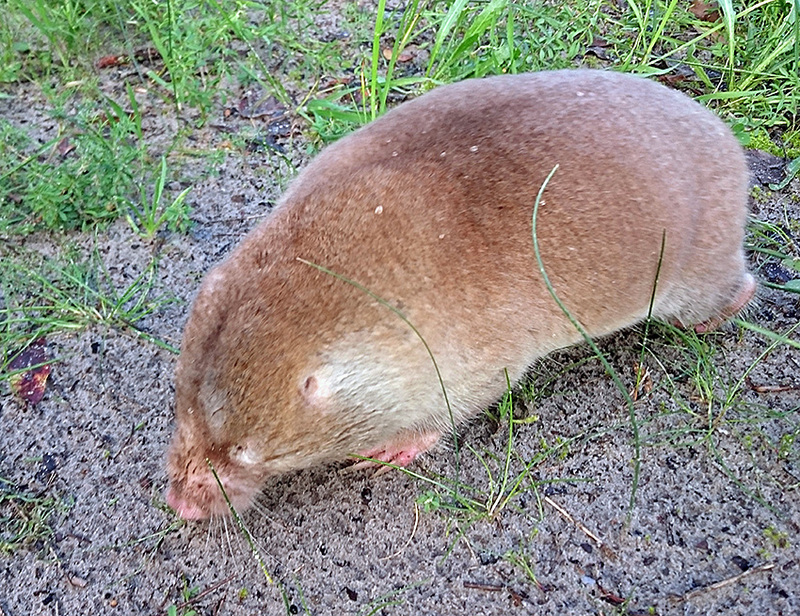 Below are a few images and video clips of the tiny critters I have found in water (fresh and sea) near our family holiday home in the Eastern Cape. First up is an insect larva. I initially thought that this might be a fly larva, but after posting the observation to iNaturalist I learnt that a number of different kinds of insect can have microscopic larva. 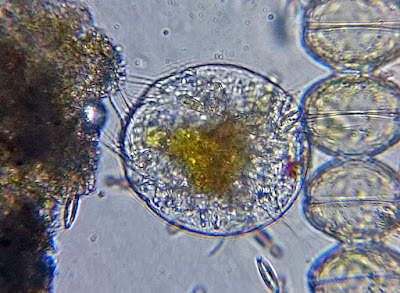 The water samples are often full of single cellular creatures. I'm not sure about the really small ones, but I believe these bigger ones are called Diatomes. 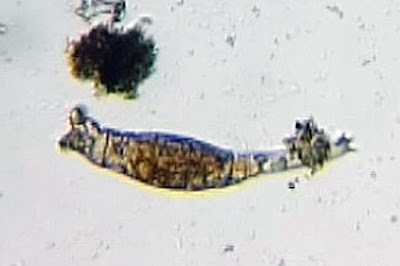 One of the coolest creatures to find is the Rotifer. This little guy was found in our large bird bath. A Rotifer can zip along using jet propulsion, although they also like to "walk"
Rotifers have the ability to create a strong water current around them that sweeps food into their mouths. 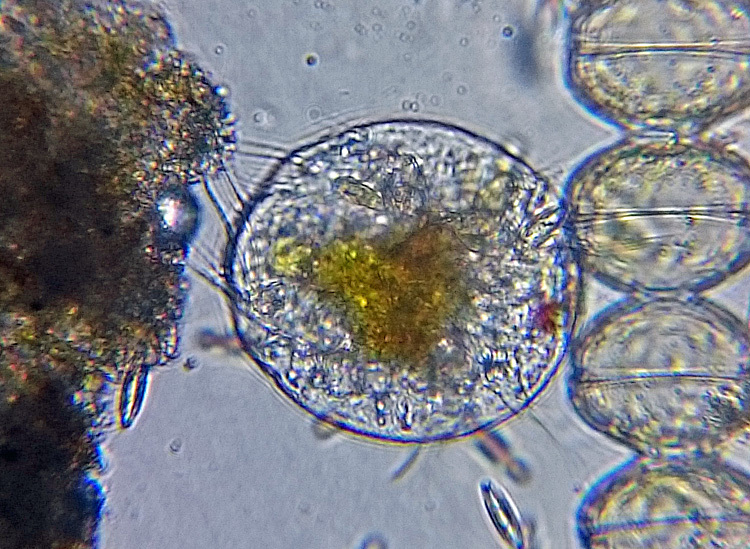 They even have a tiny brain which, according to Wikipedia, operates about 250 of the 1000 cells that make up a Rotifer! 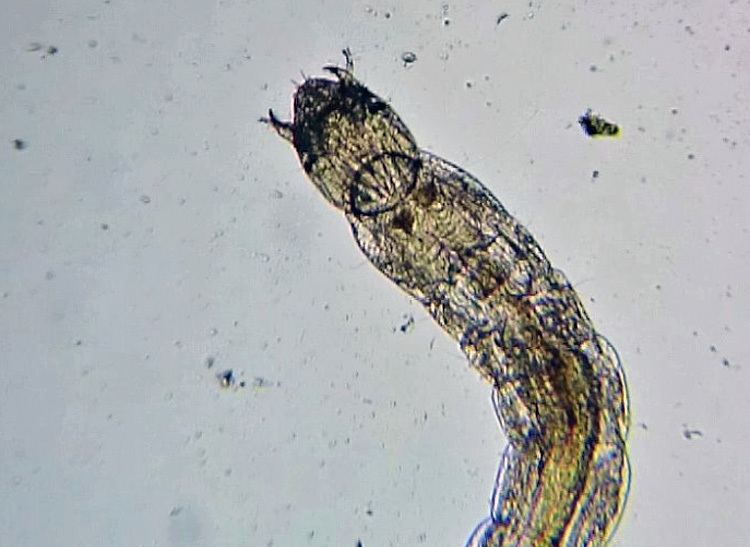 I found this worm-like creature in a water sample I took from the rocky beach. 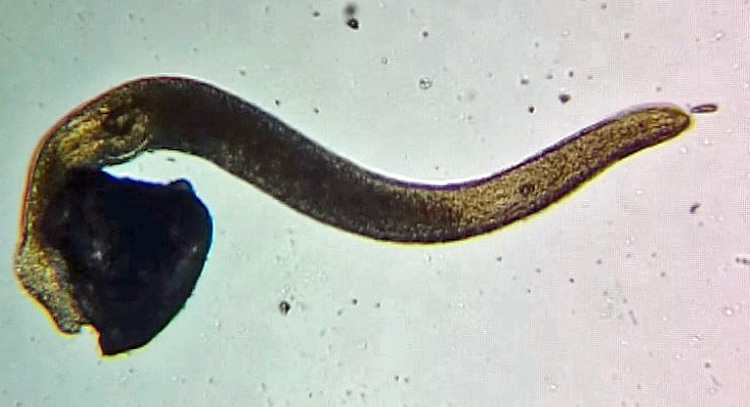 I'm still not sure what exactly it is, but I think it is a Nematode. 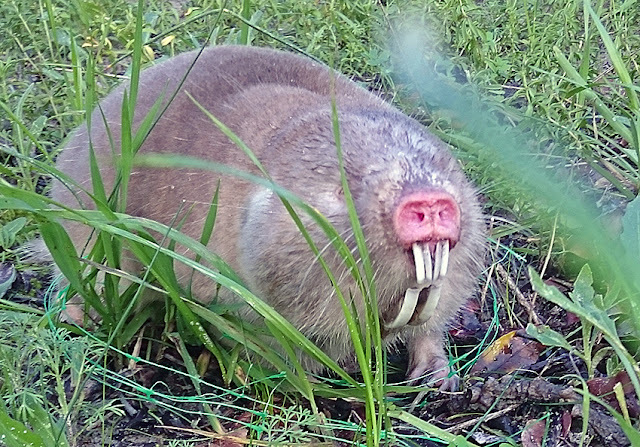 Last, but not least, is this amazing little creature. 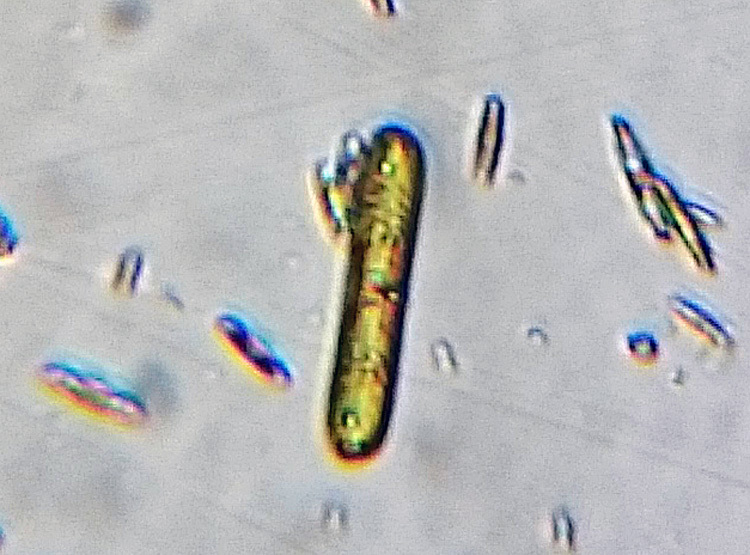 Maybe a type of Protozoan organism? I keen observer might have noticed that the photo and video quality isn't very good... Well that would be because I'm trying to hold my mobile phone at exactly the right spot to project the image from the eyepiece onto the phone's camera censor... But it is better than nothing and I'm happy to have a way of sharing this strange world with you folks out there. 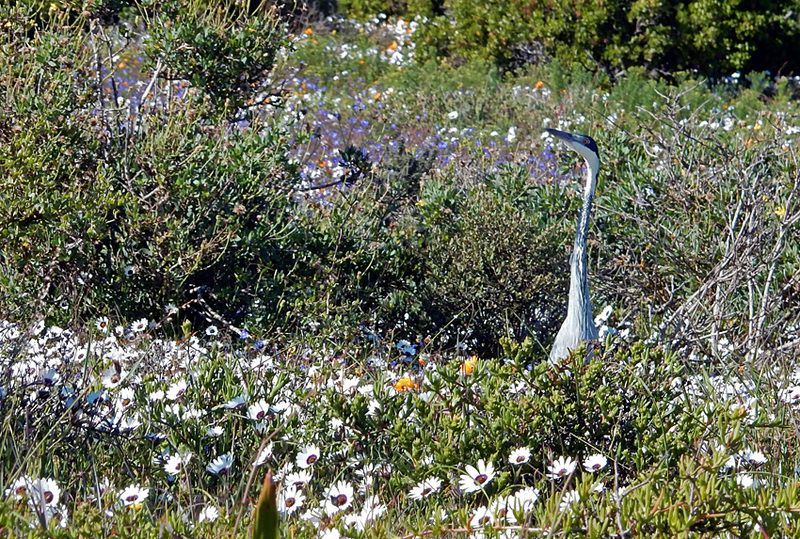 In recent years the Paarl Mountain Nature Reserve has been home to more than 11 wild mammalian predators. 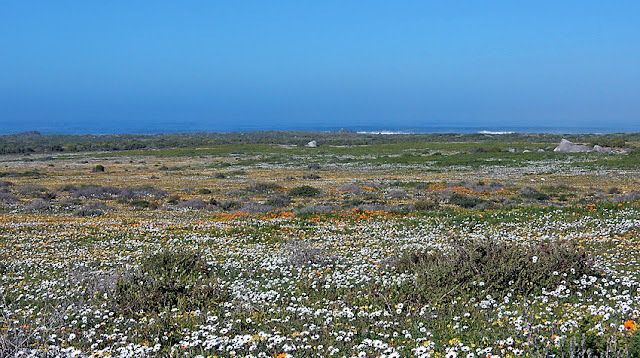 By far the most common species are the Large-Spotted Genet and Small Grey Mongoose, but there is also an alarming number of domestic dogs and cats that roam the reserve. In this blog post I want to focus on the similarities and differences between the Large-Spotted Genet and Small Grey Mongoose at the reserve. These species are more or less the same size and both prey on small mammals. Both species were camera trapped throughout most of the reserve, with a strong focus on areas where I setup the camera traps to target rodents. However, one big differences between these species is when they are active. Although they occur in basically the same areas and hunt the same type of prey, there is practically no overlap in terms of when they are active. As a result there is less direct competition between these species, compared to if they were active at the same time. One of the most peculiar aspects of the difference between these predators, and the reason for this post, is the moon. As one might expect the Small Grey Mongoose doesn't really care about the phase of the moon, yet the Large-Spotted Genet is keenly aware of it. The Large-Spotted Genet has a clear preference for nights with low moonlight. The data even shows a tendency towards being more active when the moon isn't yet out. 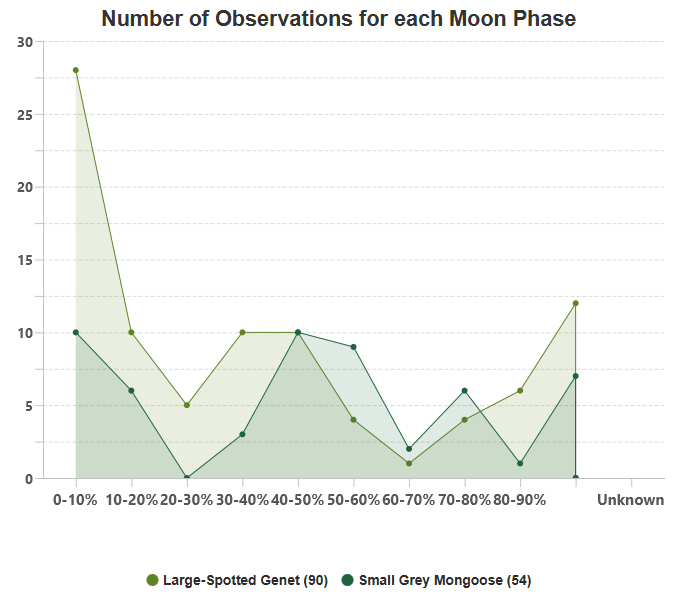 I'm not sure why the Genet is biased towards darker nights. 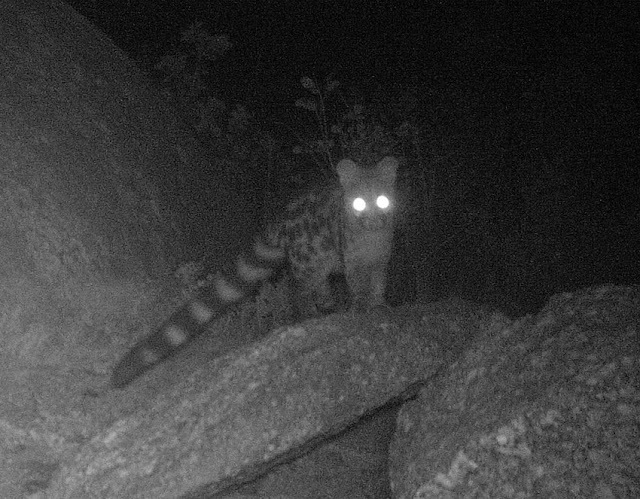 Maybe such nights give a hunting advantage to the Genet, making it harder for its prey to see it? Or maybe the opposite is true, that the Genet finds it harder to see the rodents on darker nights and thus needs to search for them more actively? I decided to pull the combined "Rodent" data to compare the results with those of the Genet. Very interesting! 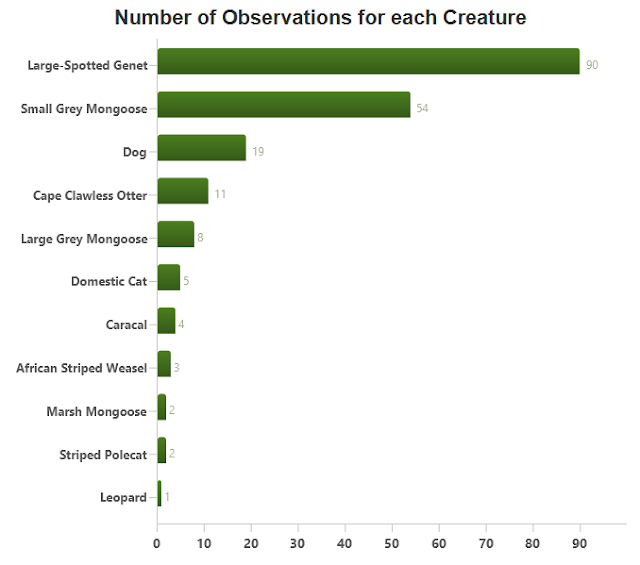 From this we see that the Rodents have the opposite bias as the Genet. 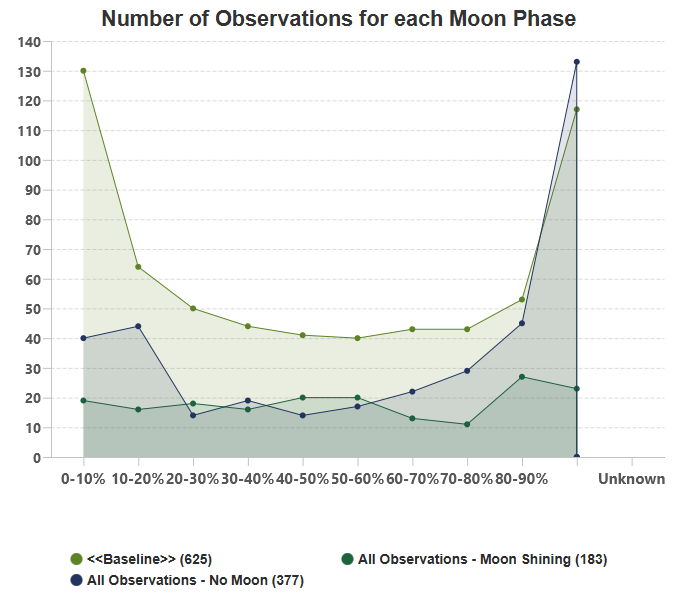 I included the baseline data to make sure that I'm not just dealing with sampling errors (maybe only sampling during full moon periods, which is clearly not the case here). Below is a list of all the predator species I managed to camera trap during August 2016 to November 2017. 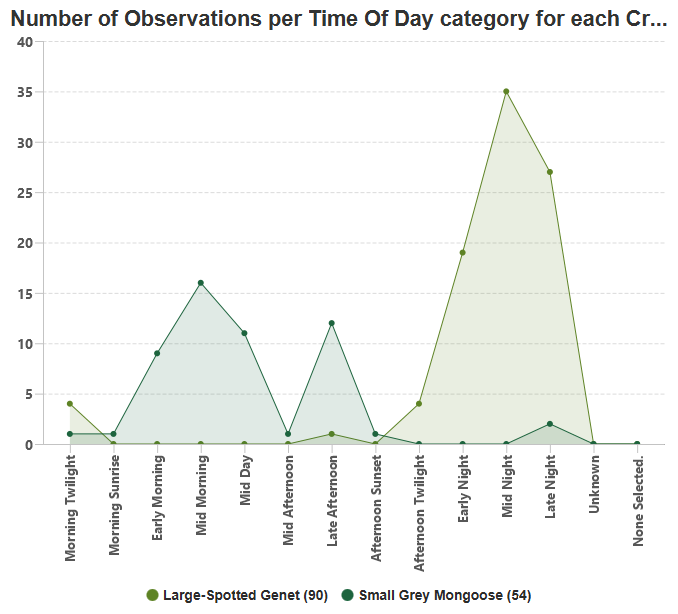 I'm happy with the results, but there are some species that have managed to dodge the camera traps. 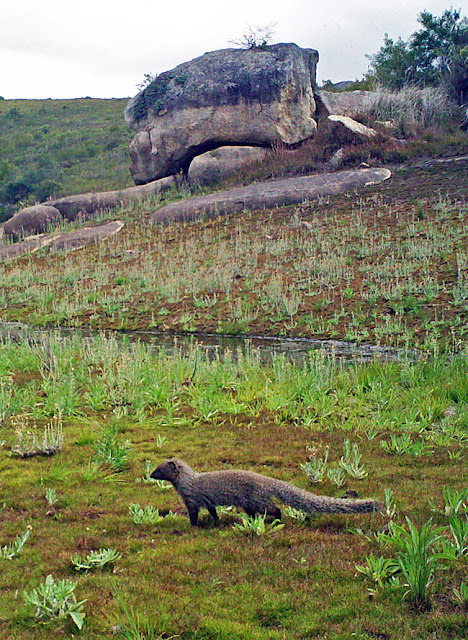 In particular I missed both the Cape Fox and Honey Badger, but both have been captured on the reserve's own camera traps in the past, so they are definitely around.